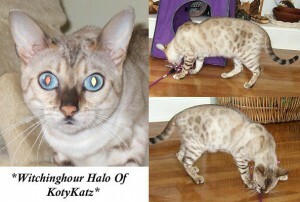 Halo is a gorgeous rosetted seal lynx point Bengal who came to us from Witchinghour Bengals! She has a fantastic personality and is always ready for fun and games. When paired with KotyKatz Echo, Halo produces very nicely rosetted seal lynx point and silver seal lynx point Bengal kittens. For information on adding one of her babies to your home please check our availability page or contact me! If you’d like to see Halo’s pedigree, click here. This entry was posted in Gallery, Reference Queens and tagged Bengal, Bengal kitten, bengal kittens, snow bengal cats, snow bengal kittens, snow bengals. Bookmark the permalink.